Wed., Dec. 2, 2015, 8:40 a.m.
Eastern Washington coach Beau Baldwin is looking forward to a 2016 season with some uncertainties on offense and an almost-intact defense. 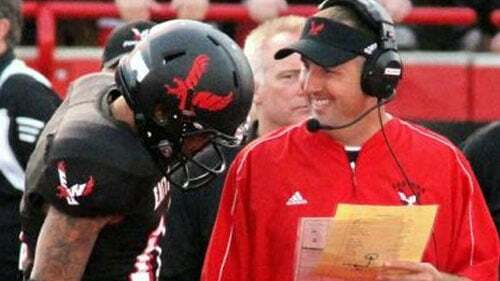 A GRIP ON SPORTS • There was some great news out of Cheney on Monday that cheered the hearts of Eastern Washington fans. But there was some news yesterday from a little farther south that probably caused a little heartburn. Read on. • Is Beau Baldwin ready to be an FBS football head coach? Yes, if he wants to be he has the skill to improve a higher-level institution’s football program. But is he positioned to earn such a job? Getting a shot these days when you are a Big Sky head coach isn’t easy. The last few guys who made the jump, including Paul Wullf (EWU to Washington State) and Bobby Houck (Montana to UNLV) sort of screwed it up for the current crop. Their failures – they were more than successful at the FCS level but couldn’t get it done at their new schools – have tainted the waterhole so to speak. We don’t know if Baldwin has loftier ambitions – he may be like his wide receiver, Cooper Kupp, and wants to stay in Cheney – but if he does, he may need to take an interim step before becoming a head coach at a decent FBS school. And that’s why the news from Eugene – that place again – has to inject at least a twinge of anxiety into the Eastern camp. Oregon’s offensive coordinator, Scott Frost, is leaving the school, taking the head coaching position at one of those directional schools down South. Yes, we kid. He’s headed to Central Florida, a school without a lot of football success recently but, and this is important, an FBS program that can serve as a springboard for a better job. He is, however, leaving behind an opening at Oregon. The smart money is on Matt Lubick filling the spot. Lubick is the Ducks’ passing game coordinator and wide receivers coach, basically the same role Frost held when now-head coach Mark Helfrich was offensive coordinator. But what if Helfrich, whose offense was stagnant this season when Vernon Adams was not available, wants to go in a different direction, sort of like Mike Bellotti did back in 2007? That’s when the then-Oregon coach reached into the FCS ranks and selected Chip Kelly to be the Ducks’ offensive coordinator. It changed everything in Eugene – for the better. Sure, Kelly was only the offensive coordinator at New Hampshire but he was in charge of an offensive that was better than what others were running. Anywhere. Baldwin’s circumstances are a bit different, but the landscape of college football has changed as well. The Eagles’ offense is Baldwin’s baby. He may not have offensive coordinator in his title – what, head coach isn’t enough for you? – but he is. He calls the plays, he’s in charge. And he’s as good at it as anyone in the country. Let me repeat that. He’s as good at it as anyone in the country. Adams leaves this year and the Eagle offense continues to excel. Was it as good as it would have been if Adams had stayed? No. But that wasn’t Baldwin’s fault. As we have seen on the big stage this year, Adams is a transcendent college talent, but remember, he wasn't that player when he came to Cheney. He developed under Baldwin. And Baldwin’s offense took advantage of his strengths. More importantly for Oregon, though, is Baldwin’s offense morphed into a different animal when Adams left and still continued to move the ball and score points. What’s going to happen in Eugene next season? The Ducks will have to do without Adams and, from what we saw earlier this year, that’s not an optimum circumstance. But Baldwin is good enough, smart enough, humble enough, to make it work – and work well. If the Ducks come calling, it’s a conversation Baldwin probably needs to have – if he wants to be a head coach at a Power 5 school someday. • But it may not be the best spot for him. There might be a better opening soon. 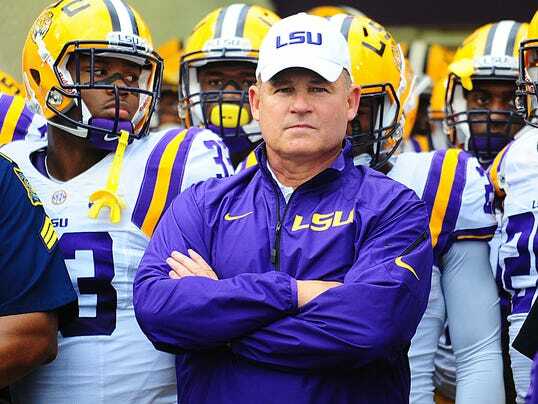 LSU came this close to running head coach Les Miles out of Baton Rouge, despite a 111-32 record at the school. It didn’t happen but a big reason Miles was under fire was an offense that seems so old school it should have Will Ferrell playing quarterback. Changes will probably be made. Cam Cameron, the current offensive coordinator, is an NFL and college retread who hasn’t developed quarterbacks all that well in Baton Rouge. If the Tigers want to run with the big guys on the SEC block – currently Alabama and Florida – they should emulate them. The Crimson Tide has a West Coast guy calling plays for them these days and, say what you will about Lane Kiffin as a head coach, you cannot argue that his offensive approach has helped Alabama. And you know who is in charge at Florida? An old Eastern Washington Eagle quarterback, Jim McElwain, who cut his coaching teeth in Cheney and the Big Sky. Sure, there would be some risk for the Tigers bringing in someone like Baldwin (and some risk for Baldwin as well, as Miles may have to win to keep his job after next season but, after the recent power play Miles’ won, I doubt it) from outside the area, but Baldwin’s track record and the recent history of similar folks in the SEC should sway the faithful. That and the 42 points they would hang on Wisconsin in Lambeau Field in the season opener next year. Will any of these moves happen? Probably not. Beau Baldwin will more than likely be Eastern’s head coach this time next year. But if anyone in Eugene or Baton Rouge or other bastions of big-time college football were to make a call and could Baldwin on sell their program, they would immediately improve. He is that good. And, after showing his wares at the top level, Baldwin would be perfectly positioned to make the next move. And I don’t doubt he would be a success at that as well. • WSU: Gonzaga travels down a slippery U.S. Highway 195 today to face the Cougars in Pullman tonight. Jacob Thorpe, who will be in a packed Beasley Coliseum this evening, has the advance of what could be the final game between the schools for a while. ... Staying with hoops, Todd Milles did a feature on Josh Hawkinson for the News Tribune. ... There is also another Pac-12/WCC matchup tonight. Utah and BYU will battle. ... Cal got back on the winning track last night. 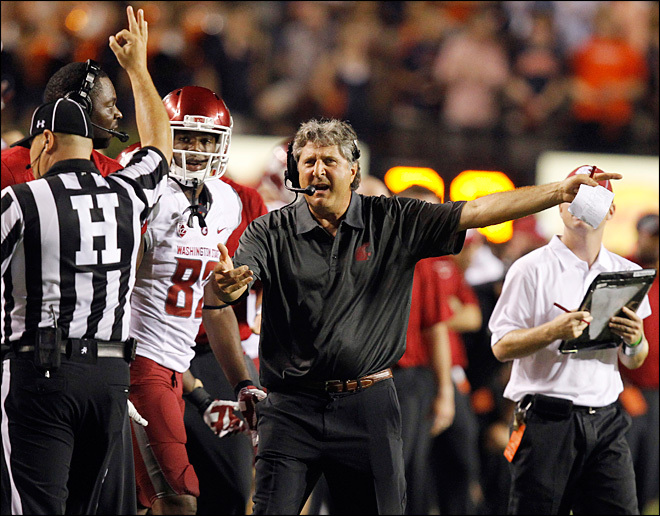 ... Now to football, where Mike Leach was named Pac-12 coach of the year. Well, co-coach of the year with Stanford’s David Shaw. No way you can have award only in Pullman, right? Jacob has the story of all the WSU honorees, including Luke Falk, who was co-first-team quarterback. There’s those two letters again. ... Jacob also has him morning links. ... The Pac-12 also announced its all-century football team yesterday and two local players were on it. Steve Emtman, who played at Cheney High and Washington, was the first-team defensive tackle while Jason Hanson, from Mead and WSU, was the kicker. ... The college football playoff pairings are about set. ... Cal's Sonny Dykes might be moving on. ... A player on WSU’s volleyball team earned All-Pac-12 honors. • Gonzaga: The Bulldog women have been this close to some big wins. But there are still chances. Jim Allen has more in his college notebook. • EWU: The Eagles’ Kupp is a finalist for the FCS offensive player of the year award. Jim has the story. ... The basketball team is cutting a path through the WCC, winning at San Francisco 81-77 last night. ... Weber State has won five consecutive games. ... Montana State won at Utah Valley State. ... Back to football, Ken Goe has a feature on Portland State’s Patrick Onwuasor. • Whitworth: Another week, another Northwest Conference basketball award. • Shock: Spokane will have a new name soon, but the franchise hasn’t announced it yet. Jim Meehan’s story explains why. ... The team did pick up another wide receiver. • Preps: Yesterday was boys. Today, Greg Lee takes a look at the girls basketball leagues around the area and features the GSL favorites, Central Valley. • Seahawks: If the Hawks make the playoffs, and their chances are better now than last week, then their passing game will have to get them there. Or something like that. ... The offensive line will also play a big part in that. ... Seattle signed a tight end to help in Jimmy Graham’s absence. ... Doug Baldwin is playing better because he’s not caring as much. ... Seattle isn’t very good at two-point conversions. • Mariners: So Mark Trumbo is once again on Jerry Dipoto’s trading block. The power-hitting first baseman was traded by Dipoto once before and is now on his way to Baltimore for a backup catcher. Seems like very little to get for Trumbo, but the backup catcher does hit left-handed, so there is that. ... The M’s are also bringing in former Giant outfielder Nori Aoki, a slap-hitting speedster. ... The next move? Should it be to trade Nelson Cruz? • Sounders: It looks as if the Sounders will be trading winger Lamar Neagle to Washington.